There are a lot of different grinder options out there so let’s find the one that best fits your needs. The two top choices for a manual grinder are the products from Gideon and Weston. For most home cooks the Gideon is the better option. 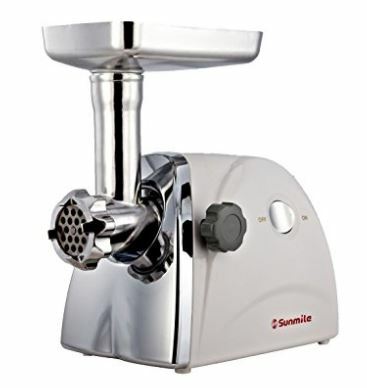 The Gideon is an easy to use grinder that works great for small batches of meat and is the top selling meat grinder on Amazon for quite a few reasons. Small and Light: The Gideon has a plastic body and a clear plastic hopper. This makes this grinder much lighter than traditional hand grinders. This grinder weighs less than three pounds and takes up very little cabinet space when not in use. Stainless Steel Blades and Plates: The blades and plates on most grinders are made of carbon steel. Carbon steel will quickly rust if not immediately dried after washing. The stainless steel blades and plates on the Gideon will not rust. Suction Base: The Gideon is held in place during use by a suction cup that enables it to stick to your counter top. I think this is a MASSIVE improvement over the traditional manual grinders which attach to your counter with a clamp. The reason I do not use a traditional manual grinder is because the base of the clamp is too wide for some of my counters and scratches up the counters where it will fit. 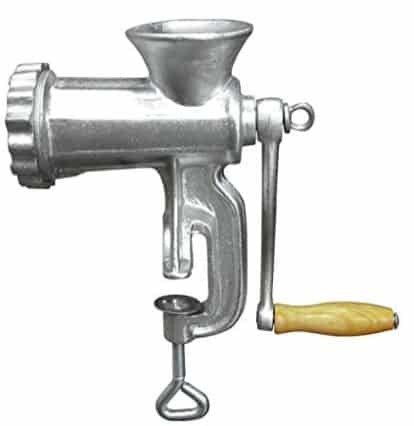 Value Priced: The Gideon manual meat grinder costs is very inexpensive and an easy investment to make. This is the classic grinder design that has sold millions of units. The grinder works fine but getting it to attach to your counter tops can be a hassle and cleaning can be a pain. I have a couple of these (people give me theirs when they find out I am a sausage guy) but never use them anymore. The only reason I suggest this grinder is that is can also be used as a pretty decent sausage stuffer. Like the Gideon this grinder is highly affordable so even if you don’t love it you won’t be out a lot of cash. Before you start looking at electric grinders you need to figure out how much you want to spend. The Sunmile is a great combination of high performance at budget friendly prices. 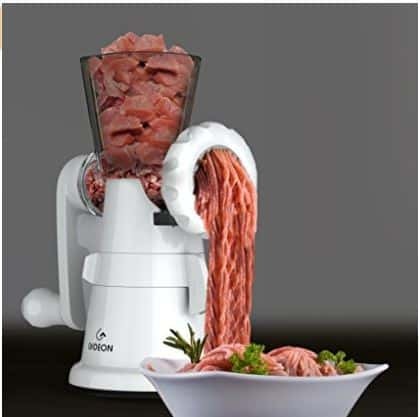 This grinder is easy to operate and works great as a sausage stuffer. The cutting blades and three different plates are made of stainless steel. The unit also comes with several stuffing tubes. The unit says it can process up to 150 pounds of meat an hour but if I wanted to grind that much meat I would go with a larger grinder. The grinder has a bunch of four and five star reviews on Amazon. Folks love the product. This grinder is NOT for grinding chicken bones for pet food and I would not use this to process a deer. At this budget price please don’t expect a commercial grade unit but do expect a great little machine that will serve you well! If you are ready to make an investment into a serious piece of equipment then the LEM Big Bite #12 is the machine for you. This unit costs about $400 and is the most affordable high end grinder available. 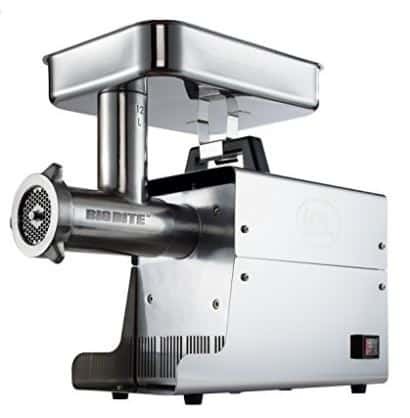 This beefy, 47 pound grinder comes with stainless steel plates and blade. More importantly it comes will ALL METAL GEARS that are backed up by a five year warranty. 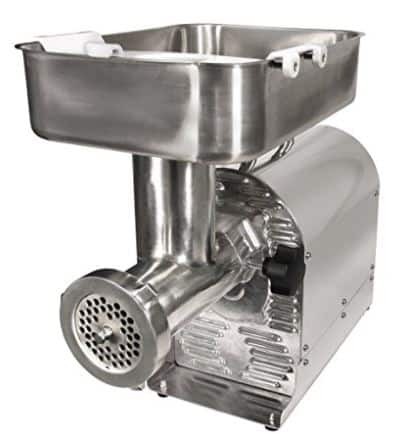 It comes with everything you need to make sausage, etc and can handle over ten pounds of meat per minute. The powerful motor on this grinder lets it handle the sinew and tendons on a deer with ease. This is the grinder I would buy if I wanted to process a couple deer per season. Using this grinder for chicken pieces is a mixed bag. There are a lot of Amazon reviews saying that this is exactly why they bought this grinder and that it can handle wings, drumsticks and even quarters with ease. 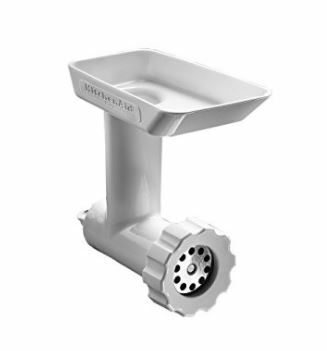 LEM states that this grinder should NOT be used to grind chicken bones. I suspect that if anything went wrong with your grinder after putting some chicken through it LEM might not want to honor the warranty. I use the Food Grinder Attachment for my Kitchen Aid stand mixer and have always loved it! The grinder has always met my needs, is easy to clean and is a breeze to use. 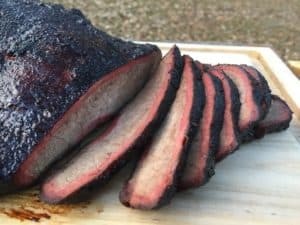 I grind pork butts and chuck roasts with this attachment and have been happy with the results. This unit does not come with stuffing horns but they are available. I have talked to a few folks who have tried using this for stuffing sausages and they were not please with the process. Great as a grinder, poor as a stuffer. If you love your KitchenAid stand mixer then this is a must have accessory. This grinder goes through chicken like nobody’s business. The best part is that you can save hours of prep time since you don’t have to chop up the pieces. You can drop in whole drumsticks, wings and quarters and this grinder handles them like a champ. This is not a cheap grinder but that is the point. There is nothing cheap about this equipment. This is a high end commercial grinder that is absolutely PERFECT for the job you need it to perform. Here is a video showing the Wesson 22 in action. Mark is able to easily grind 50 pounds of chicken in five minutes. You can buy other grinders for $150 and use them to grind chicken parts. It will be slow, miserable work and the grinder will break in a year. Click the link, go to Amazon and read the reviews. You will see everyone loves this grinder for making healthy food for their dogs and cats. Now get out there, buy yourself a grinder and get busy taking on all of the projects you have been dreaming about!